She was so friendly and cooperative — and still needs to get home. Police officers in Ontario, Canada, were responding to a call about an animal at large this week. And found a supersized pig with an even bigger personality. In fact, the pig practically ran into one police officer's arms. A local man reported the pig, according to a press release from Ontario Provincial Police, claiming the animal had been hanging around a property in Lanark County for at least three days. When officers arrived, the sow needed little convincing to come quietly. "The pig appeared friendly and cooperative and voluntarily surrendered to temporary custody and safe keeping at a local farm," police noted. The pig-without-a-name was taken to the farm, where she's being kept warm and well-fed while police try to piece together her mysterious past. We've seen cases of pigs tumbling out of trucks bound for slaughter - and finding a happy ending at an animal sanctuary - and pigs rescued from abusive homes. But never an enormous pig just relaxing in a snowy field. And it seems this pig has already spent a lot of time around humans who cared about her. 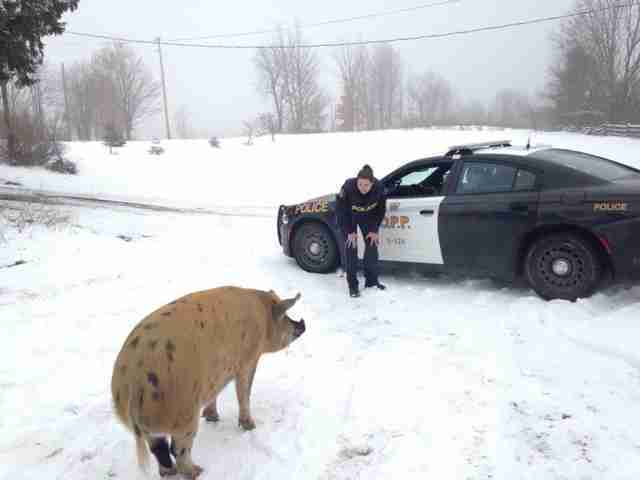 In fact, she wasted no time in charming police in Lanark County, who decided to, at least temporarily, call her Miss Piggy. Another police division wasted no time in tweeting back. We'll update this story as more details on Miss Piggy's story emerge. In the meantime, if you happen to have misplaced your pig, please get in touch with the Lanark County Detachment OPP at 888-310-1122.